Over the last two centuries Australia has been plagued by many feral animal brought in by settlers from Europe and other parts of the world. This includes rabbits, foxes, camels, pigs and many, many more species. FeralScan is a collaborative project between Federal and State Governments, private organisations and community to map and monitor distribution of various feral animals on Australian continent. By mapping the damage caused by these animals, FeralScan can help to identify when, where and how to control these animals in order to reduce their impact on the environment. For example, there are more than 1 million wild camels currently roaming the Australian desert and causing damage to water supplies and disturbing Aboriginal communities. 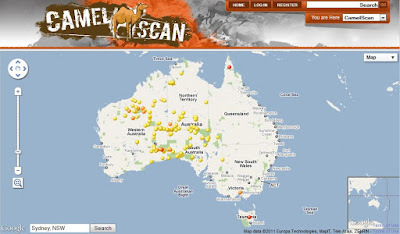 CamelScan, a crowdsouced initiative under FeralScan project, allows anyone to report sightings of feral camels in Australia on a Google Map. Thanks to this initiative scientists involved in the project will be able to develop regional maps, as well as national picture of where feral camels occur, and work out where they congregate in different seasons.